Buy, eat, drink and enjoy! Do I want to be a Hacker? Update: Recently opened a US bank Account, read the post here. Since we will be in Fernie for 5 months, I thought it would be easier to open a Canadian bank account. There were a few reasons for this. The first was the volatility of the rand. I find it easier to budget for the trip at a fixed exchange rate. This may mean I win or lose a little depending on what the Rand does, but this way I have a clear idea what the trip will cost us upfront. The second challenge is the general hassle factor of using a South African credit card when overseas. I like to limit my cell phone charges when overseas so I usually divert my SA number to voicemail while overseas. After the first one or two transactions, the bank will try and reach me and when they are not able to do so, they stop the card for overseas use. Needless to say that leads to allot of frustration. I knew it would take a few days before I got a Canadian bank account open. So I informed the bank before we left that the card will be used overseas for the next 5 months. Despite that when I tried to do the first important transaction it was declined. This was around 15:00 in Fernie, so already very late into the night in SA. It took a 30 min call back to SA to finally get the transaction approved. Thirdly there are quite a few merchants here in Fernie whom charge you an extra 2% if you pay with a Credit Card. Opening a Canadian bank account would help with all these. Before the trip I called the local TD Canada Trust branch and tried to open an account before we arrived, but that was not possible. I then tried online but also didn’t have any luck there. After a few google searches I was not sure it would be so easy for a foreigner that is a non-resident to open a bank account. But like most of our experiences here so far it was a breeze. It took me all of 5 minutes to open a cheque account. I left with my debit card and Internet banking profile all done. The only hiccup was I needed two documents for identification, one was my passport, but they didn’t want my SA driving license, so they ended up using the Canadian Visa as the second document. Getting a additional card for my wife was just as easy. What was interesting is that the ATM was inside the bank. So when I wanted to withdraw money on Friday evening, I was not sure if the ATM would be accessible. It was, they had a flimsy door separating it from the bank, and through it you could see the open bank safe. I wonder how long it would be before somebody breaks into the bank if this was in SA. Once the account was open I wanted to transfer money from South Africa to the Canadian bank account. I had completed forms and gave the bank back home a copy of my passport and airplane ticket before I left, to finalize it as quickly as possible. Despite that there was a few days delay, luckily the exchange rate moved in my favour while I waited so it all worked out. So far everything has gone great with the Canadian bank account. We have done a few transactions with the debit cards; I have downloaded the iOS app and the Internet banking works like a charm. 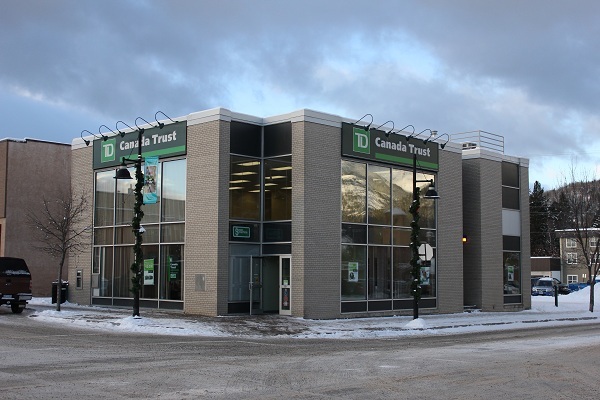 Thank you to Andrea Gignac from TD Canada Trust – Fernie that made helped me to open a Canadian bank account. If I knew it was going to be this easy, I would have opened a Canadian bank account when we were in Fernie in September when we were here to find a place to rent. That would have probably saved me a few thousand rand, but that is how we learn, I suppose. This entry was posted in Fernie, Settling in on 2012/12/10 by Justinus. Heli-skiing with CMH at Galena – Best Skiing EVER!! Creating an oversupply of developers! Can YOU change someone’s life in 3 months?